I'll also be designing a layout class for July....will show you when I'm done K? i love this...must make it in july. christine and i love love love your 2 album classes this month but couldn't make the dates. hope there's an encore, especially the garden album next month. I like everything you do! I can not wait to see every detail of your project here on the blog ..
You are a queen of minis!! I can see a lil interactive there. Gorgeous as always!! what a lovely project...love it! The detail and layers on this project are amazing!! I wish I was there:-) coming In Sept again let's do some fun then! 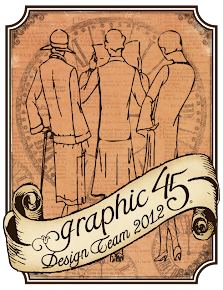 GRAPHIC45 is coming to town!!!! !